Interesting would be the word of choice to describe John Huston’s final film. Being familiar with his early work (The Maltese Falcon (1941) and The Treasure of the Sierra Madre (1948)), I haven’t explored his remaining catalogue. With The Dead, I was initially taken aback by how incredibly different it was from the other two films mentioned. Both Falcon and Sierra Madre are undoubtedly male works – their perspectives are deeply entrenched within the male framework, wherein Huston deconstructs notions of bravado and greed with great insight. Such deconstruction is refreshing, in that they illustrate the kinks in the hegemonic armor. 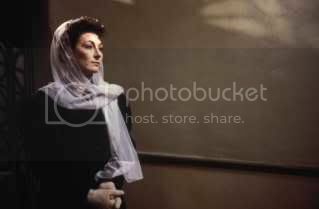 But with The Dead, its Altman-esque ensemble doesn’t promote the idea of male hegemony ever being in place. Perhaps it could all be read in the title- the hegemony is dead. Retrospectively speaking, it’s fairly clear what The Dead refers to. 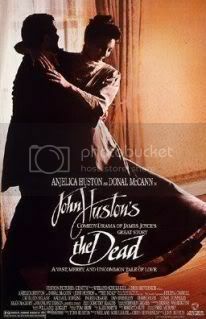 Though it’s quite amusing that Huston never really addresses what the dead means up until the end, wherein Gabriel (Donald McCann) passionately mulls over distressing news from his wife, Gretta (Anjelica Huston). But before I get into that, Huston positions us at a Christmas party, where Gabriel and Gretta meet with friends and family. The event is boisterous and festive, with Gabriel’s family regaling everyone with stories, poems, and music. It’s a lovely scene that Huston frames; a very Irish and traditional setting, with characters moving in and out of the frame in a way that would have made Robert Altman proud. We never escape the confines of the household – its set-up very much like a stage play, wherein we move from the entrance, to the stairs, to the living room, to the dining room. We rarely retreat from one locale within of the household from the other – it’s as if everyone arrives, enters the living room, and dines in the dining room at the same time. As the festivities move to dinner, we shift tone, with Huston embarking upon more serious territory. What was once joyous now carries a level of solemnity, as Gabriel toasts his aunts, whilst acknowledging that their time is slowly reaching an end point. At the table is a drunken Freddy (Donal Donnelly), who holds the dubious honor of always making a fool of himself at every get-together – Freddy’s mother is embarrassed by her son’s antics. Meanwhile, Gretta seems detached from the whole scene- she is obviously thinking about something – someone- and it’s eating away at her until she finally reveals it to Gabriel. The film’s runtime is consumed largely by people gathering and enjoying each other’s company, even if there are some lingering thoughts that persist within the characters minds. But there’s a section of the film that feels so terribly unfocused and prolonged- as the dinner guests depart, I sensed the disunity amongst them, as if pleased to escape into their own lives. It was difficult to accept such an outright contradiction to what I perceived from the onset of the film. Of course, that all sort of sheds light on the meaning behind Gretta’s speech, which brings about more questions than answers. And that’s what The Dead does so admirably – it questions one’s placement in the world in relation to those they love. Here’s a film that I envision I will only grow to hold dearer to me as time goes on – and once I give it another look.